GOROD took the technical death metal scene by storm with their latest piece of art “A Maze of Recycled Creeds” and we were eager to talk to band’s mastermind Mathieu Pascal about GOROD’s music and his take on technical death metal. Hi Mat, you recently released “A Maze of Recycled Creeds” and it’s amazing. What can you say about the writing process? Do you follow the same formula since the beginning or does your writing process also evolves along with your music? Mat: Hey, thanks for the kind words! Yes, the writing process is quite the same since the first album. I use to write the two main guitars and the drums patterns , sometimes bass parts when it’s difficult to feel the harmony the right way. I try to bring the most achieved model of the song before we start working together on it. All arrangements, additional parts, vocals are usually set during the recording or mixing of the album. One thing that changed on this album compared to the previous one is the comfortable time we had here to finish it. We did everything by ourselves, without any dead line, so we took the necessary time to make the song perfect, from writing to production. On the other hand, it’s our fifth album, and it becomes harder and harder to find fresh and brand new musical ideas, and I don’t want to just repeat or copy myself. That’s why ,I think, it took so much time to release it! One of the most important aspects of GOROD is that you manage to balance the brutal and “delicate” parts in a tasty manner. The songs flow really well and you don’t play complex stuff just for the sake of being complex. What can you say about this? What do you think makes GOROD different? Mat: I always thought that technique have to serve songwriting. It’s just a tool to express musical ideas. Moreover, it’s something natural for us. I mean we don’t play fast because we are just able to do it, but because it’s our way to express brutality and frenzy. Technique also allows to play anything that lies in one’s head, and pushes boundaries of creativity. I don’t want to say that technique is the only way to make good music, sometimes simple things are more efficient for some particular goals, but even these simple things have to be performed the right way, accurately, and a good instrument technique allows to play complex stuff as basics. Maybe another thing that is different with Gorod is our musical culture and all the exotic influences that spices our DeathMetal, like traditionnal world music, latin jazz, etc… I guess there’s not so many bands that mix all that wide range of influences, and I hope this makes us original and unique. Technical death metal is not an easy genre to perform, but I think it’s even harder to compose. If you don’t pay attention to the general feel and structure of the songs, they can become a pile of notes with all kinds of time changes without any actual feel. What can you say about this? Is there a trick for writing “meaningful technical death metal“? Mat: As you say, the important is to constantly looking back to the song entirely, and not focus on only one part of the song, and just fill out the rest of the song with gratuitous technical stuff. I took some classical composition lessons at music school when I was younger, and one thing I’ve learned and never forget is that it’s actually the structure of the song that’s memorable, not the details or the individual sections inside. There are some basic structures (I mean for example : intro, verse, chorus, verse, chorus, etc…), used in popular and mainstream music, that can work for any style, even deathmetal. And oddly, you can stay surprising and original when following one these basic song structures, but it’s more difficult to do! I think the listeners don’t like and don’t need to be constantly surprised and brutalized, musically. On the contrary, maybe they prefer to “ride” the music, following the flow more than fighting it. Well, that’s just my vision of composing and I know there are many ways to apprehend this aspect of music. For some time, France may be the most frutious country in Europe in terms of metal. Sure the Scandinavians play great metal since forever, but in terms of quantity and quality, France seems to have a high statistics. How does it look like from the inside? Is this a good time to be a metal band in France? Mat: Yes, not so bad actually. There are a lot of metal associations and concert organizers and it’s quite easy to make shows. When we travelled the world, particularly in the US, which we considered as the metal paradise, we realize that there is no special country for metal, It will always be an underground style, kept alive by passionned people. Regarding the previous question, although France had a strong black metal underground for many years, it seems like a plaethora of new generation bands emerged in the scene after the breakthrough of GOJIRA. Do French metal bands respect GOJIRA in this manner, helping thre French metal scene to get noticed by a wider audience? Mat: Of course, I’m happy to see the scene growing since Gojira rised, and I don’t know a band that doesn’t respect Gojira for this. We have a lot of good international bands and that’s very cool to catch them on european festivals, and party together! I have to mention our buddies from Benighted, Kronos, Trepalium, Svart Crown, The Great Old Ones, Otargos, all these bands performs regularly outisde France and I must admit this makes me proud! 5 albums and 3 drummers. So how did you find Karol? Did you do any auditions and what made him stand out to become the new GOROD drummer? Mat: Actually I met him in 2007 when I record the 1st album of his band JUGGERNAUT, and found him incredible. At this time Sandrine, our former drummer has just left the band, and we were looking for a drummer. I asked Karol about this but he refused, because he already played in 3 or 4 bands at this time (good drummers don’t know unemployment!!) Two years ago when Sam left, it’s obviously the first person I called to replace him. He’s an excellent drummer, and moreover, he’s from Bordeaux (our same hometown), so it’s never been so easy to see each other and work together. Do you have any trouble reflecting GOROD’s music in a live setting? 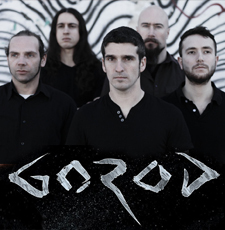 With an intense and complex music like GOROD’s, the sound in the venues is really important. Are you lucky with the venues, or do you experience any problems frequently? Mat: Well, we tour with a sound engineer since 2005, so the audience is rarely disapointed with the sound. When we grew up, it becames obvious that we couldn’t trust the local sound guys, that sometimes never heard about metal or just didn’t care about the bands! I know our sound guy can make a great sound even in poor venues with a few means. The only thing that can vary is our own comfort on stage, but we learned to be less demanding, being more autonomous. I know we will still play in small venues or bars, so it’s pointless to complain about this, the important is the sound the audience hears! One of my all time favorite bands is THEORY IN PRACTICE. During an interview back in 2000, they say “Don’t play technical death metal because that costs your money, time, effort and you lose your friends and your girlfriend pays the bills and you can afford a car, etc”. Interestingly enough, they got back together after 13 years and releasing new stuff again. I assume you experienced the tech death scene back in 2000-2002, so how different is it to play in a technical death metal band today, compared to 2000? Mat: Ahah nothing changed I guess! The quote is really true, it’s almost impossible to make money with metal in general, and of course it’s harder with technical death metal, because there are less listeners. Financial issues are the only reason I’d give to end my band. Everyone in the band is getting older, and it becomes more difficult to manage with our jobs, families. We have to make some sacrifices to keep the band alive, and it’s sometimes ununderstandable for our girlfriends, bosses, etc… Moreover it’s hard to get a serious job when you have to go on tour half the year so…Well, music is our passion and we live only to be able to continue with it, and we will go forward until we can’t do it anymore. You know, that’s the actual reason of all these line up changes, never musical reasons. Sandrine left the band because of her job that took too much time to her. Guillaume, our former singer, left the band because he has spent all his holidays touring with us, and he just would like to have a normal family life. We can’t blame them for that, that’s life, simply. Last question, can you name some of your favorite metal albums from 2015? Mat: First of all, the new KRONOS album “Arisen New Era”, which I was waiting for many years! And I can’t wait for the new REVOCATION album, that should be release this month. That was all, thanks for your time and music, you guys are an inspiration to many. Thank you too for your support and interest. Hope to meet you sometime soon on stage!